There's one thing more dangerous than testifying to a crime - staying silent. Locked in the ruins of a California Mission, Abby Travers watches helplessly as a girl dies outside her window. As she struggles between her moral obligation to come forward as a witness and her commitment to a Medieval religious practice that requires her to retreat from the world, the situation spins out of control. Abby's hesitation starts a series of catastrophes. She finds herself at the center of a deadly cover-up where every minute counts and indecision could be fatal. She questions all her beliefs, and everyone she knows becomes suspect. To save herself and those she loves, she must break free from her self-imposed prisons of stone and fear. The Sanctity of Sloth is a taut psychological thriller that answers the question: What happens when a good woman does nothing? Fans of Paula Hawkins and A.J. 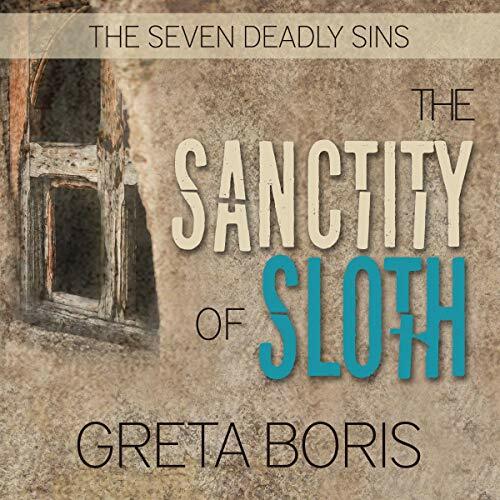 Finn will enjoy this third book in Greta Boris's Seven Deadly Sins Series. Another winning mystery by Greta Boris! I’m addicted to her fast-paced, twisty stories with characters that I feel by the end of the book are my best friends. Not the villains—those I hope never to meet outside these pages. The story fascinated me with anchorite lore and even some peeps into landscaping and tourist trade at a California mission. Best of all was the suspense of the mystery that kept going deeper and deeper. I’m not sure I should say anymore about the plot as I don’t want to spoil the surprises, which just keep coming. I bought the book but I mostly listened to it. It made housework and daily walks fly by. In fact, I think I walked faster during the scary parts. The narrator was fabulous. The story required a wide range of accents, which she handled easily. I thought at one point I knew who the villain was through a narration inadvertent revelation but no—the narrator was able to fool me along with other story red herrings. Totally recommend the ebook and audio book to mystery and suspense and thriller readers and to those who like to learn about arcane religious practices.